Visiting a Career Fair isn’t the same as an interview, but it does give you one on one time with employers and recruiters. It pays to be ready to answer the typical interview questions and gives you a chance to practice your skills. Don’t forget you need to ask Employers questions to. Here’s a few good ones. What skills do you look for in a candidate for this position? What’s a typical career path for this position? Here are a few you should know a quick answer to. And they’ll be the first you’ll answer in an interview as well. What type of support do you offer your employees during onboarding? What is the most popular benefit your company offers among current employees? The beauty of this question is it makes you look smart, and positions the employer to brag about their benefits or company culture. Win, win. Take inventory of your current posture. Are you leaning foreward? Crossing your legs? Trying to make yourself small? Or are your shoulders back, chin slightly up, legs comfortably strong and are you smiling or content? Here’s a popular video about some great tips for conveying strength and confidence. 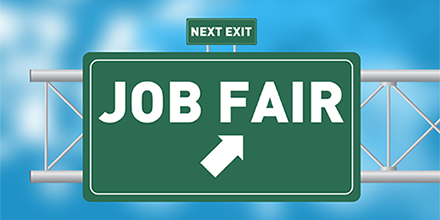 Now that you’re a pro at Career Fairs, we hope to see you at our upcoming career fair, April 18th, 3:30-6:30 pm at the Cedar Rapids Mariott. Register today!